Oh man this plant run the course! I planted my "baby plant" when I was pregnant with Alex and it is now 3 years old. It has now counted all three pregnancies and kept its lovely place on my kitchen window sill. You'll notice that it has also had its share of bumps and bruises (just like the boys, I suppose.) Henry used to take his baths in the kitchen sink. That is, until he grabbed my plant and sent it crashing...now it has a permanent ding. No harm done, though. Henry now takes his baths in the big boy tub and my pot - scars and all - keeps on countin' down the weeks for Brother #3. If you are a long time blog reader, you might also notice that the actual plant is considerably smaller than it used to be. It was getting so big that I had to transfer it to a bigger pot and transplant a smaller one to this one. Maybe someday I'll have a house full of ivy pots to match my house full of children. Hope so! 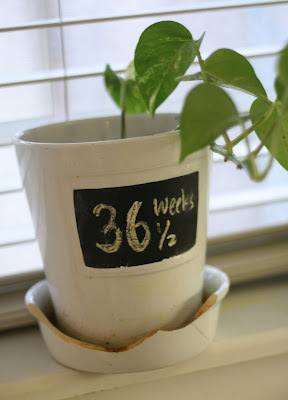 Thanks, Baby Plant, for helping Mama keep track of the days. Baby Brother, we can't wait for you to arrive! You do know how that happens right? To which I developed a few responses depending on my mood: Yes, and we can offer pointers if you like. Yes, and I really like it. Yes, and we decided this was better than giving it up. No, can you tell me?